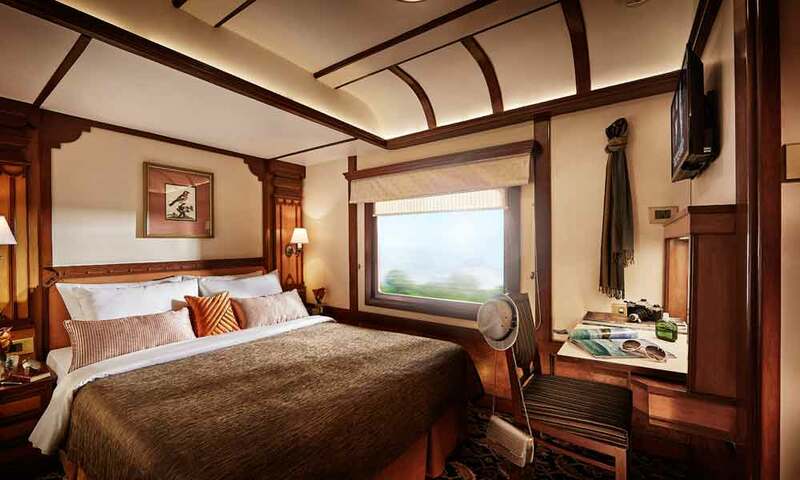 The Deccan Odyssey has 4 sumptuously royal Presidential Suites on board. Each spacious suite is twice the size of the deluxe cabin and has a master bedroom equipped with a queen sized double bed. The bed area is separate from the living area with its elegantly carved furniture. The entire suite has plush floor to floor carpeting. The suite has not one but it has two attached bath and toilet with shower and hot/cold water. Guests can enjoy TV and channel music of their choice with a built in CD/MP3 player. Presidential Suite: 205 sq. ft.